Cotler was recognized for efforts on human rights, promoting Wallenberg legacy, and defence of political prisoner during a reception attended by dozens of MPs, Senators, the ministers of Foreign Affairs, Finance, Justice & Attorney General, and Employment, Social Development & Multiculturalism, civil society and community leaders; academia; and family. Irwin Cotler, M.P., Mount Royal, was awarded the Raoul Wallenberg Centennial Medal by the International Raoul Wallenberg Foundation (IRWF) on October 28. The reception was co-hosted by Andrew Scheer, Speaker of the House of Commons, John Baird, Minister of Foreign Affairs, Thomas Mulcair, NDP leader, Justin Trudeau, Leader of the Liberal Party, and the IRWF. In 1985, Wallenberg was named Canada’s first honourary citizen; in 2001, January 17 was established as Raoul Wallenberg Day in Canada and in 2012, the City of Montreal bestowed honourary citizenship on Wallenberg. Master of ceremonies Prof. Irving Abella, scholar, historian and author, referred to Irwin Cotler as ‘the conscience of Canada’ in his remarks. Speaker Scheer greeted the assembled guests noting how the House of Commons – ‘a House of professional speakers’ – becomes respectfully silent when Irwin Cotler rises. Foreign Affairs Minister John Baird brought greetings from Canadian Prime Minister Harper and saluted Prof. Cotler as ‘a great Canadian and citizen of the world’ and noted how in the darkest hour of history, Wallenberg through his heroic actions shined a light. Murray Rankin representing Leader of the Official Opposition Thomas Mulcair, shared that Prof. Cotler was one of his personal heroes in Parliament who “practices what he preached” around the world. As a fellow law professor, Rankin marveled how students still recall Cotler’s law lectures even 40 years later. Liberal Leader Justin Trudeau shared how Cotler embodies the Biblical passage from Deuteronomy “Justice, Justice shall you pursue,” adding a personal note of being reminded of his own father [the late Prime Minister Pierre Trudeau] and over the years being able to turn to Cotler for his logic, fierce intelligence and devotion to what is right and just. Trudeau characterized Cotler as “an inspiration, a dear friend and mentor” to him and to all 308 Members of the Canadian Parliament. Green Party Leader Elizabeth May thanked Cotler for all he has given Canada, including as Minister of Justice bringing “an extraordinary blend of intelligence, kindness, and compassion” – being a mentor to others rather than using his skills to “cut opponents to ribbons”. She recalled Cotler was the most frequently arrested Justice Minister that Canada has ever had, referring to his arrests while defending political prisoners. 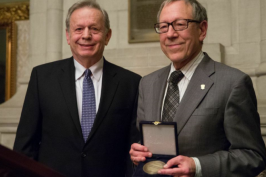 Prof. Cotler humbly accepted the Wallenberg Centennial Medal from Dr. Mordecai Paldiel, who represented the IRWF, sharing the teachings of his parents who taught him the values that shaped his life. Cotler paid tribute to his wife Ariela who nurtured and imparted these human rights and justice values in their four children, while being the true politician in the family in the trenches all these years. In his remarks accepting the Medal, Cotler noted this year marked the 70th anniversary of Holocaust (Shoah) of Hungarian Jewry and the 70th anniversary of the rescue of the remnant of Hungarian Jews. Professor Cotler was recognized by the IRWF for his longstanding commitment to preserving the legacy of Raoul Wallenberg, the Swedish diplomat who saved tens of thousands of Jews during the Second World War before being arrested by the Soviet Union in 1945, and disappearing into the Soviet prison system. Wallenberg was named Canada’s first honorary citizen in 1985. The IRWF recognized Professor Cotler’s efforts in Holocaust education, in the combating and prevention of mass atrocity, and in the defence of political prisoners worldwide, including Natan Sharansky and Nelson Mandela. Professor Cotler served as counsel to the Wallenberg family in the 1984 U.S. case Von Dardel v. USSR, which found the evidence “incontrovertible” that Wallenberg hadn’t died in 1947 as the Soviets claimed. In 1990, Professor Cotler chaired the International Commission on the Fate and Whereabouts of Raoul Wallenberg with professor Guy von Dardel – Wallenberg’s brother, and in 2001, he was instrumental in establishing January 17 as Raoul Wallenberg Day in Canada. Past recipients of the Raoul Wallenberg Centennial Medal include former UK Prime Minister Gordon Brown, European Commission President José Manuel Barroso, and leaders of Greece, Denmark, Slovakia, and Armenia.